With its historic elegance, celebrated fine dining and gorgeous weather, Charleston is the perfect place for a couple’s retreat. A Charleston, SC couple’s getaway offers plenty of opportunities for romance and fun. Whether you’re planning a trip just for the weekend or heading off on an extended stay with your significant other, there’s no shortage of surprises and attractions for couples. Here are some suggestions for making the most of your time together in the Holy City! If you’re looking to enjoy the outdoors, you’ll find many great ways to soak up some sun and fresh air. Make a day of it and explore one of the several historic plantations in the area! At Magnolia Plantation, you can saunter through the gardens of blooming azaleas and camellias, traversing picturesque bridges over placid waterways. Or try Boone Hall Plantation for hand-held strolls beneath live oaks draped in Spanish moss. For a shorter outdoor endeavor, stay downtown and visit Hampton Park. It may not have the historic grandeur of the plantations, but it’s a gorgeous respite from city life. The park offers beautiful walking paths and fountains with lush green spaces and a wonderful assortment of flowers bursting with color. And of course, there’s always the beach! If you want to jump into some excitement together, Folly is the beach of choice. There’s always something fun going on! If you’re looking for a more intimate beach experience, take a trip to Sullivan’s Island. This low-key beach community is perfect for couples. Get your feet wet along the shore, and stay for an absolutely amazing sunset you won’t want to miss. The Halsey Institute of Contemporary Art displays world-renowned artists and one-of-a-kind exhibitions in its gallery space. 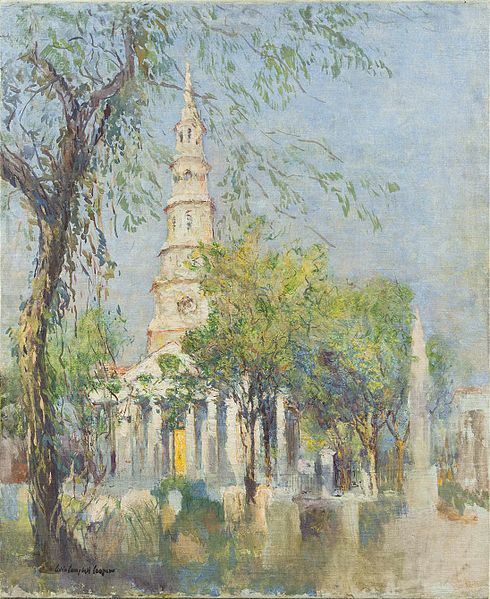 It’s also connected to the College of Charleston, so you can explore the charming campus after taking in the art. Then walk to the historic French Quarter, where you’ll find an art gallery on nearly every block. Plus, if you time your trip right, you’ll find yourselves in an art lover’s paradise: On the first Friday of every month, there’s a celebrated art walk, where you can move from gallery to gallery and enjoy complimentary wine and snacks while soaking up the Lowcountry art culture! After exploring the local galleries, take in a show together. Charleston is home to over ten theatre companies! 34 West Theatre Company is but a short stroll from the art walk. Known for their wonderful romantic comedies, there’s a reason nearly every one of their shows sells out! Their sidesplitting humor and heartwarming tales will leave you uplifted as you exit their space into the cool Charleston night. It’s no secret that Charleston is a culinary utopia, and nothing says date night quite like a romantic dinner for two. There are so many amazing restaurants in the area to choose from. But for a truly unique and romantic dining experience, consider making a reservation at Chez Nous. (And don’t forget that ‘”make a reservation” directive. This space is very small and very popular). It’s a candle-lit, intimate setting like no other, and its culinary delights are on par with any in the Holy City. Of course, great drinks are always on the menu for the ideal Charleston, SC couple’s getaway! If wine is your after-dinner drink of choice, both Bin 152 and O’Hara and Flynn have the cozy wine bar ambience made for couples. Or if cocktails are more to your taste, try The Belmont. The bartenders here are true artists, mixing up craft cocktails in an environment that is posh without being pretentious. However you choose to spend your time, finding the perfect retreat to wind down at the end of the day is essential. That’s where Walk Away Stays comes in. We offer the finest luxury vacation rentals in the Charleston area, each impeccably designed and decorated. We have many rentals that are perfect for a couple’s getaway! Browse our one bedroom vacation rentals for the cozy and romantic stay of your dreams. So much for all of our suggestions above—you may just find yourselves spending all your time indoors!